SEOUL, South Korea (CNN) -- Former President Chun Doo-hwan was indicted by prosecutors on bribery charges along with five former senior officials during his presidency Friday, the domestic Yonhap news agency reported. An investigation that preceded the indictment found that Chun amassed a slush fund of more than 700 billion won ($890 million) during his 1980-88 presidency, the agency said. The illegal fund alleged to have been acquired by Chun exceeded the 500 billion won (now equivalent to $630 million) that his successor Roh Tae-Woo has confessed to building up during his 1988-93 presidential tenure. State prosecutors said Chun would be formally charged on Friday, but declined to confirm if the action had already been taken, as reported by Yonhap. BOGOTA, Colombia (CNN) -- One of the six imprisoned leaders of Colombia's Cali Cartel escaped from a Colombian jail Thursday, according to police. Jose Santacruz Londono, reputed to be the number three leader of the cartel, escaped from the maximum security La Picota prison on the outskirts of Bogota Thursday afternoon. All exits from the city, including the airport, had been closed off and a large-scale search was under way. Authorities were still conducting an investigation into when and how Londono managed to escape. General Rosso Serrano, head of the Colombian National Police, was said to be urging Colombian President Ernesto Samper to offer an award of $2 million dollars for the capture of Londono. The Cali cartel was said to be responsible for nearly 80 percent of the cocaine smuggled into the United States. Londono was captured by the Colombian police in July 1995, and has been indicted for the murder of Cuban-American journalist Manual de Dios in Queens, New York. His prison breakout is reminiscent of the 1992 escape of the now-dead leader of the Medellin Cartel, Pablo Escobar. LIMA, Peru (CNN) -- An American woman was convicted of treason Thursday and sentenced to life in prison without parole by a secret Peruvian military court. Lori Berenson, 26, was convicted of helping leftist guerrillas. She was tried as an alleged member of the Tupac Amaru Revolutionary Movement, which has bombed banks, kidnapped people, and killed civilians. The prosecution had asked for 30 years in prison, but the court gave her the maximum sentence. Police claim Berenson coordinated some of the group's activities and helped it obtain arms. Her lawyers and family deny the charges. They also say Berenson can't be tried for treason because she is not a Peruvian citizen. Her lawyer in Peru, Grimaldo Achahui, said he would appeal. The court ordered her sent to Yanamayo prison, a maximum-security penitentiary for convicted terrorists in the windy city of Puno. Berenson is the sixth foreigner convicted of terrorism since 1980; three others are serving life sentences. JERUSALEM (CNN) -- Two Israeli paramilitary policemen were grazed when a bomb exploded near a joint Israeli-Palestinian patrol in the Gaza Strip Thursday, military officials said. 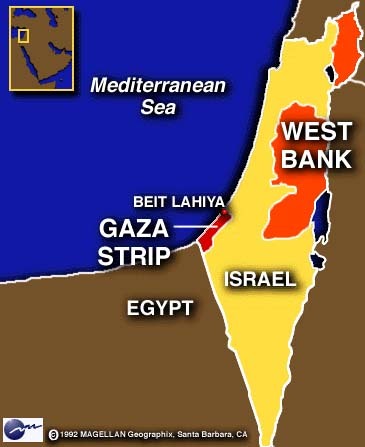 Israel and PLO security forces jointly patrol the Gaza Strip under their 1993 peace deal, which handed much of the area to Palestinian control. The militant Islamic group Hamas threatened last week to attack Israeli targets following the assassination in Gaza of its key members and bomb-maker Yahya Ayyash, who was killed when a booby-trapped cellular telephone exploded. QUITO, Ecuador (CNN) -- A damaged tourist ship struck in the waters off the Galapagos Islands was threatening to spill 40,000 gallons of fuel, which could destroy some of the archipelago's rare wildlife, an Ecuadorian deputy warned Thursday. Galapagos Deputy Eduardo Veliz said the ship's hull was damaged, the engine rooms were flooded, and the fuel tanks were in danger of spilling their contents into the ocean. He said that could cause "irreversible damage" to the area's exotic sea and land wildlife. The Galapagos Explorer smashed into some rocks Saturday. Some 72 passengers aboard were rescued, and none of them was said to be injured. The Galapagos Archipelago -- known around the world for its giant tortoises -- was declared by the United Nations as one of the world's natural assets more than 20 years ago because of its unique wildlife. The islands are one of Ecuador's main tourist attractions. MEXICO CITY, Mexico (CNN) -- Three Americans, allegedly members of a drug trafficking gang, have reportedly been released from custody in Mexico. The three were being held in connection with the murder of a Roman Catholic cardinal. The Los Angeles Times reported that U.S. officials believe drug traffickers used their influence to have the men released. Cardinal Jesus Posadas Ocampo was one of seven people shot at the Guadalajara airport in 1993 in what authorities said was a shoot-out between rival drug trafficking gangs. Both U.S. and Mexican officials said they didn't know why judicial orders were issued to release the men. 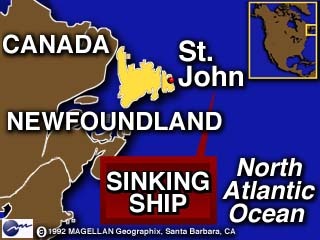 ST. JOHN'S, Newfoundland (CNN) -- In a race against an impending storm, all 24 sailors were rescued Thursday from a Greek-registered cargo ship that was sinking in rolling, frigid waters off Newfoundland. The Amphion, carrying heavy ore and minerals to Philadelphia from Europe, issued a distress call Wednesday. The ship was damaged by the storm that blanketed the East Coast of the United States with snow earlier this week and had to be abandoned because of increasing risk that shifting cargo would cause it to capsize. Lt. Cdr. Glenn Chamberlain of Nova Scotia's Rescue Coordination Center said a Canadian Hercules aircraft dropped 20 survival suits to the crew, who then got fished out of the sea by another ship, the Leonard J. Cowley, shortly before dawn. Officials said the Amphion could sink by Friday because it is without a crew to help stabilize it and another storm is moving into the area. 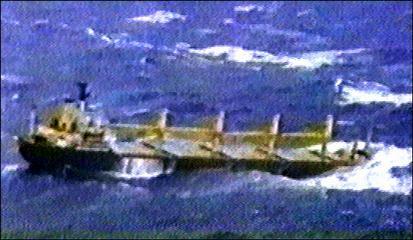 Meanwhile, the crewless vessel could be a hazard in North Atlantic shipping lanes about 720 kilometers (450 miles) southeast of Newfoundland. 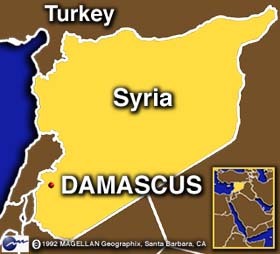 DAMASCUS, Syria (CNN) -- U.S. Secretary of State Warren Christopher, in Damascus to boost peace negotiations between Israel and Syria, is urging President Hafez al-Assad to give more power to his delegation when peace talks resume January 22. Christopher also told Assad to stop playing games if he wants peace with the Jewish state. State Department spokesman Nicholas Burns said the issue of "who should be in the room" is high on Christopher's agenda for his meeting with Assad on Friday. Another goal is to get Assad's views on what the agenda for the next round of talks should be. Christopher will then take Assad's response back to Jerusalem to present to Israeli Prime Minister Shimon Peres on Saturday. Christopher may make a side trip to the West Bank to see PLO Chairman Yasser Arafat. Burns said Christopher and Israeli leaders with whom he had met would like to see at the negotiating table a Syrian military official with authority to talk about security arrangements at the border. It is expected the talks will resume later this month at Wye Conference Center in eastern Maryland. GAZA STRIP (CNN) -- Israel is continuing to release Palestinian prisoners held in jails throughout the Jewish state. Most were returned to their homes in the autonomous Gaza Strip on Thursday, while the rest went to District Coordination Offices in the West Bank self-rule areas. Under a September peace accord with Yasser Arafat's Palestinian Authority, Israel released 1,000 Palestinians in October and is in the process of freeing another 1,200. Israel's justice ministry said most of those freed had murdered or wounded Palestinians who helped Israel. The ministry said they would be barred from Israel until the rest of their sentences had expired. The was much emotion among the Palestinians being reconciled with their family and friends. But not everyone was happy. The PLO accused Israel of violating the agreement by releasing mostly non-political detainees. More releases are due next week. SYDNEY, Australia (CNN) -- Relays of volunteers are keeping six stranded whales alive Thursday by supporting them as they lie in a shallow Australian seaside hotel swimming pool. Wildlife officials fear the melon-headed whales would drown if they were not kept with their blow holes just above the water surface. The pool is too small for the whales to rise to the surface in their usual arching manner in order to breathe. The weakened whales had beached themselves twice in 48 hours in rough surf on the country's east coast. "They're fairly comfortable and stable, their breathing rates are stable and their pulse rates are fairly normal," said Parks and Wildlife spokesman Eric Claussen. Wildlife officials are seeking a suitable release point for the whales. 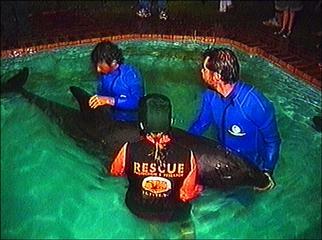 Meanwhile, hotel guests are swimming with and nursing the sea mammals. The whale is also known as the electra dolphin or small killer whale. 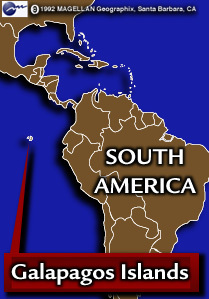 They frequent tropical and sub-tropical waters. They can go three weeks without food.